Think entry level cars and the two names that spring up are the Alto and the Eon. Ever since the birth of the original Maruti 800, the 800cc engine capacity has been the success mantra for the entry-level segment. But with their spending power getting better day by day, people want more for their money. 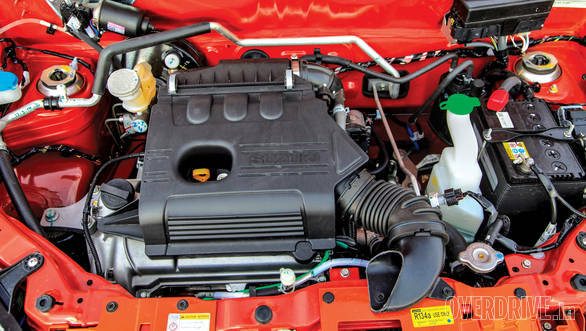 It has led Hyundai and Maruti to believe that there is enough demand for one litre engines in this segment and the results therefore are the Eon 1.0 and Alto K10. While the Eon got its one litre engine recently, the Alto K10 has existed for quite some time. But the latter was given a revamp recently with an improved engine, a revised chassis and all-new bodywork. Though based on the familiar 1.0-litre, 3-cylinder K-series engine, the new mill is dubbed as the K-Next and boasts low-friction components and better thermal management. The result is an engine that is not only more refined, but also more efficient with its fuel useage. Even if you have used the existing Alto K10 enough, you may not notice the improvement in refinement levels. More so because of the lack of enough noise insulation. But noise insulation isn't top priority for this segment anyway. 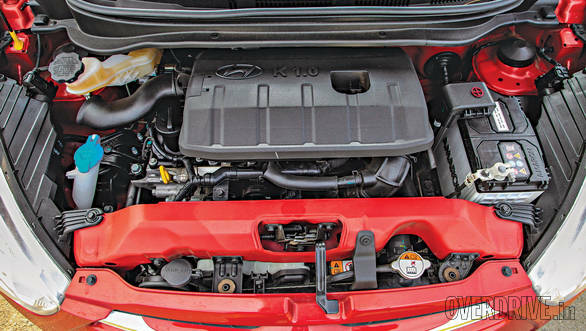 Comparatively, the Eon's 1.0-litre Kappa engine, which comes from the previous generation i10, has noticeably more vibration from its three-pot mill and they can be felt at lower revs. But the Eon has better noise insulation and as a result, its cabin is calmer. The Kappa engine seems tuned for quick acceleration, but the mid-range feels quite flat. So if you step on the throttle, the car pulls just fine, but you would hardly do that in city conditions. The strong low-end makes it easy to drive the car in stop and go traffic even with the air-conditioning operating at full swing. But for overtaking or scaling flyovers, a downshift is often required. Even the top end whack is quite good. The engine doesn't feel stressed at highway speeds and manages to return good fuel economy as well. While the ARAI figures show a wide difference in the efficiency figures of the Alto and Eon, the real-world figures aren't very far apart. 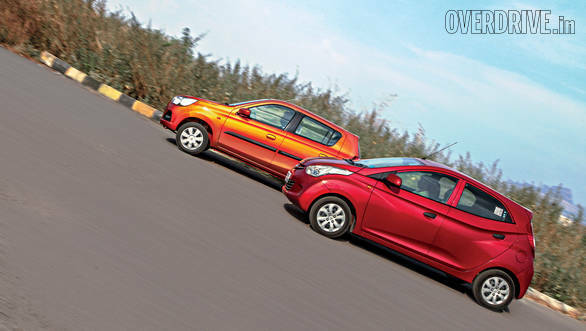 In our tests, the Alto K10 was good for an overall 18.3kmpl, while the Eon manages 16.9kmpl. 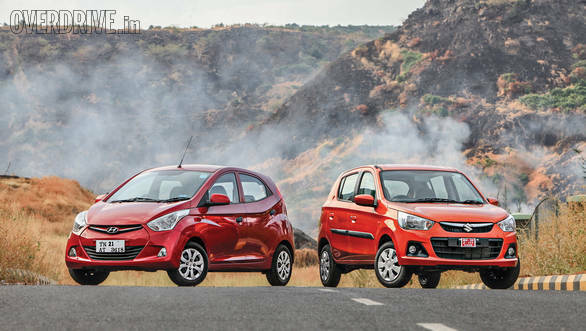 The Alto K10 has a relatively stronger midrange. The torque spread seems the meatiest between 2,000 and 3,500rpm all the way to the fourth gear and therefore it doesn't demand gear changes as frequently as the Eon does. The low-end is pretty decent too. Complementing the engine is the steering, which feels quite direct for city driving. It starts getting softer as the steering angle increases. 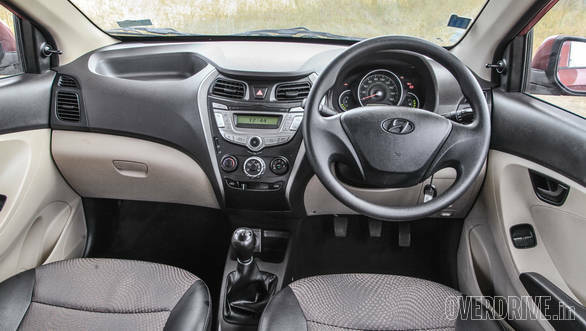 The Eon, like any other Hyundai, has a steering that has a dead at-centre feedback. It is surprisingly heavy too. While both cars come with a 5-speed manual gearbox, the Alto K10 also has the option of an automated manual transmission (AMT/AGS), which as we mentioned in the previous issue, is effective and highly rewarding. The Alto K10, then, is a better city slicker. The Alto's engine feels more eager, but the tall ride height plays spoilsport. It feels too wallowy and highway speeds begin to feel unnerving. The slim tyres makes things worse. Surprisingly, the Eon feels like a more grounded car in comparison. Though the tyre sizes are similar, the Eon has better grip and feels more composed under braking. It not only feels more stable at highway speeds, it also has better dynamics through corners despite being a tall boy. There is generous body roll, but it isn't as pronounced and discouraging as in the Alto K10. In typical Hyundai fashion, the Eon has a soft ride quality as well. The Alto comes close with a cushy ride over undulated surfaces, but the moment you subject the car to sharp bumps or potholes, you will hear annoying thudding and crashing sounds. Expect these to lead to rattling plastics within a few thousand kilometres. Speaking of plastics, the Eon has the upper hand with its proven build quality and elements that are nicely put together. The prim and proper finish of the larger Hyundai cars has trickled down to the Eon as well. The Alto K10's dashboard plastics look and feel scratchy, but panel gaps are hard to find. It is a big step forward over its predecessor. The use of fabric inlays in the door pads adds more appeal to the cabin. There is little to choose between the design of the two cabins. The Eon has a symmetrical layout with simple satin-finish inserts. The generous contouring and matte treatment looks good and to me the green backlight for the switches looks better than Hyundai's favourite blue. The quality of the switches and the rotary dials is very good too. The centre of attraction inside the Alto K10 has to be the wedge shaped centre console. It is fairly large and makes the dashboard look wider than it is. It has simple lines and depending on what you prefer, it can either look bland to you, or can make the Eon's dash look busy. 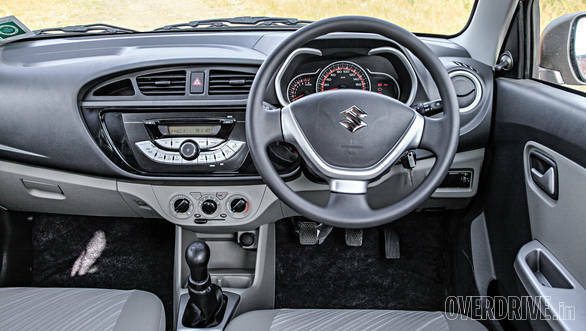 Since the switches and knobs are mixed and matched from the Maruti Suzuki parts bin, the overall layout doesn't look as uniform as in the Eon. The storage spaces on the dashboard fascia aren't that useful either. The triangular cut next to the central AC vents can accommodate a sachet of mints at best and the bay on the surface of the dashboard is too shallow and slippery. That is a good thing, as it should prevent people from placing loose items on the dash. 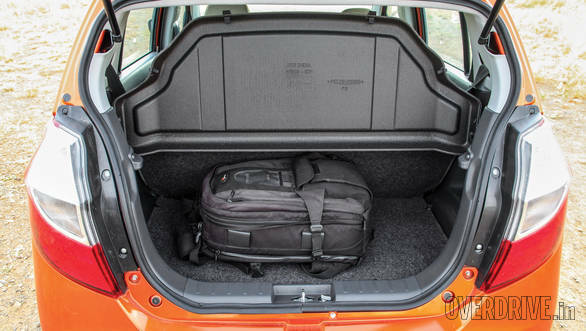 But that said, storage space is a big matter of concern in the Alto K10. The cabin can only accommodate one water bottle, two medium sized cans and soap case worth of knick-knacks. The door pads are only good for an issue of our magazine each and the glove compartment will feel bloated after swallowing a bunch of documents and a sunglasses case. The Eon fares better in this regard. More importantly, the Eon has better cabin space as well. 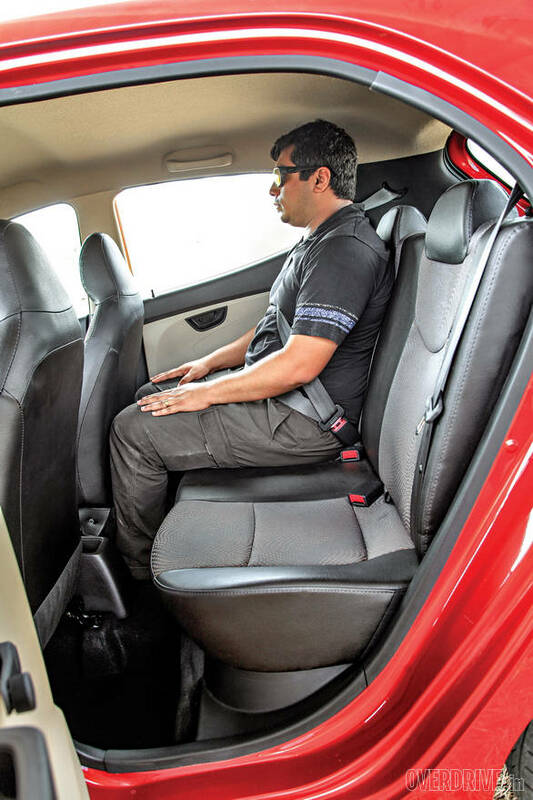 The shoulder room is more or less similar in both cars, but knee and head room is better in the Eon. Ingress and egress is better too, since the seats are placed higher in the Eon than the Alto K10. Since both these cars are the ideal 'first cars' and are largely bought by nuclear families, the Eon is better suited for a family of four adults. In all likelihood, this would comprise of two adults and their parents and the easier ingress and egress is therefore a boon. The rising window line in the Eon makes the rear windows smaller which is known to make kids feel claustrophobic, but isn't that big a concern for adults. 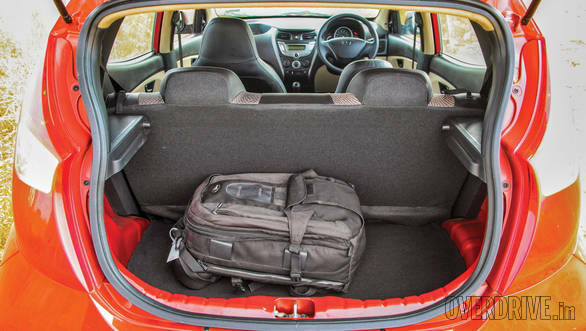 It is one of the reasons why the Grand i10 sold in India has different rear doors and larger windows than the European model. 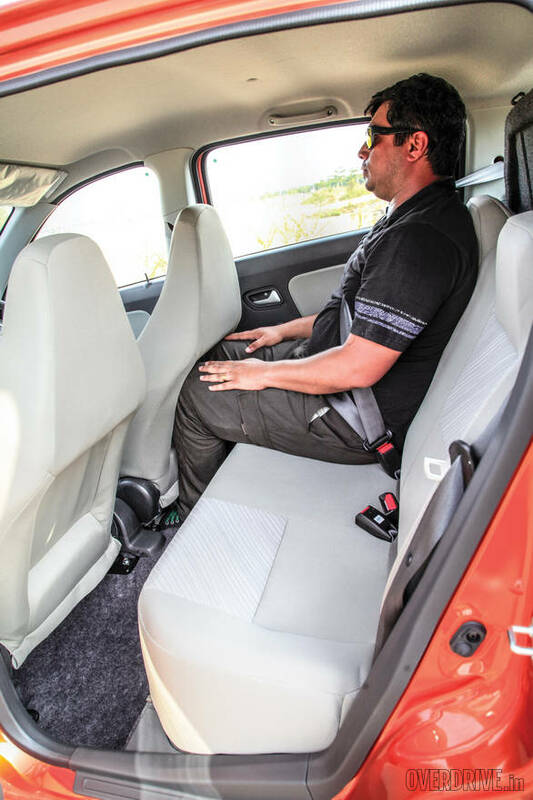 The Alto K10 on the other hand has a bigger cabin than its predecessor, but is still small enough to make four adults feel like shrink-wrapped packs of milk cartons from a supermarket. Having two kids at the back instead, makes more sense. The backrests of the rear bench of both the cars is too upright and their headrests then are pretty pointless. They are neither comfortable nor will they prevent whiplash in case of a rear end collision. Speaking of collisions, the Alto K10 gets a driver-side airbag on the top-spec trim, but no ABS. The Eon doesn't get either. Hope that changes after the recent Datsun Go and Maruti Suzuki Swift debacle from the Global NCAP tests. As far as the designs are concerned, the Eon, though dated, still looks smart with its radical lines and creases. Apart from the badges, there is no design distinction between the one-litre variant and its 800cc counterpart. The Alto K10 on the other hand is a very different looking car. 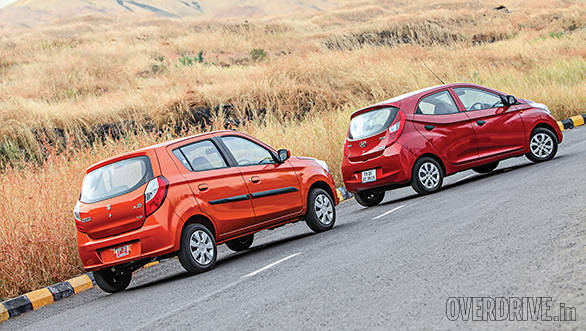 Though it shares the same doors, windows and roof as the Alto 800, it sits on a completely different chassis and wears larger headlamps and tail lights that bear resemblance to the family. The bumpers have the awkwardly big fog lamps that are typical to the K10. While the previous K10 looked more aggressive than the older Alto, the new K10 looks simpler and cleaner than the current Alto 800. It is a fresher looking car, but not as lean and racy as the Eon. Design though, is a personal preference. For that, you wouldn't be wrong in choosing the Eon. It also has a roomier cabin, is well put together and has a premium feel to it. But it also charges a big premium for that space and quality. That said, the Alto K10 doesn't lag far behind on all these counts. It is on par in terms of the features, but also demands far lesser money for it. In fact, at Eon money, you could walk out with the automatic variant of the Alto K10 and still have some loose change. In that sense, though the Eon is the better car, the Alto K10 is the better deal.